Help them your little ones to dream big with this sweet Disney Magical Beginnings breakfast set. 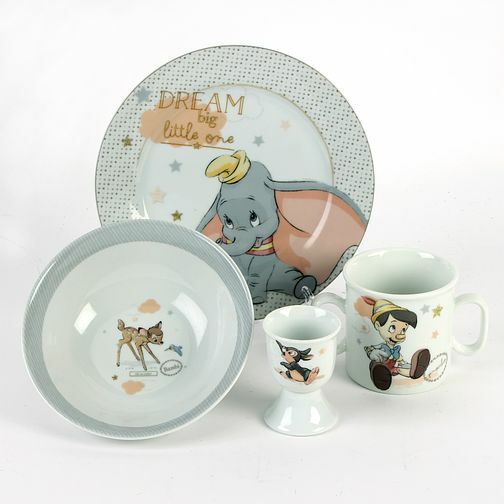 Featuring some of your all-time favourite Disney characters, including Dumbo, Bambi and Pinocchio, this breakfast set includes a plate, bowl, egg cup and mug. This is the perfect gift to get your little ones enjoying breakfast every day of the week. Disney Magical Beginnings Breakfast Gift Set is rated 5.0 out of 5 by 1. Rated 5 out of 5 by Anonymous from Lovely Gift. Wanted a personal lasting christening gift for my granddaughter , and decided on a breakfast set. Found this Disney magical beginnings set and thought it perfect , and at a very good price. Most sets are three pieces , cup , plate and dish...but this one also has an egg cup. Perfect ! I wouldn't hesitate to recommend both the set , and Samuels.